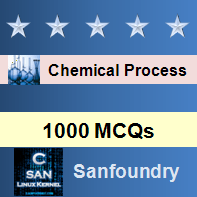 This set of Chemical Process Calculation Multiple Choice Questions & Answers (MCQs) focuses on “Element Material Balances”. 1-3. 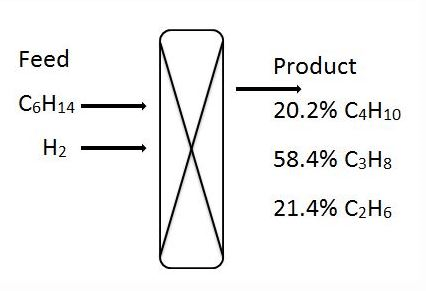 For the given hydro-cracking problem, mole percent of products C4H10, C3H8 and C2H6 are 20.2%, 58.4% and 21.4% respectively. 1. What is the mole percent of C6H14 in the feed? Explanation: Element material balance for each element. 2. What is the mole percent of H2 in the feed? 3. Molar ratio of H2 consumed to Hexane reacted in the process? 4-6. For producing 40 % Methane, 20% Ethane and 40% Butane, a reactor is feed with Pentane and Hydrogen. 4. What is the mole fraction of Hydrogen in the feed? 5. What is the mole fraction of Pentane in the feed? 6. What is the ratio of Hydrogen to the Pentane in the feed? Explanation: Ratio = 104/48 = 2.167. 7-10. C3H8 is burned in air with a composition of 40 moles and 100 moles. 7. What is the number of moles of CO2 in the product? Explanation: Moles of CO2 = Extent of the reaction*3. 8. What is the number of moles of H2O in the product? Explanation: Moles of H2O = Extent of the reaction*2. 9. What is the number of moles of C3H8 in the product? Explanation: Moles of C3H8 = 40-Extent of the reaction. 10. How many moles of O2 are required for the complete combustion of C3H8? Explanation: Suppose x moles are required then 0.21x = 48.